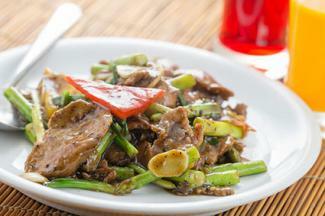 Ostrich is a lean and tasty meat with a rich flavor. Due to its very low fat content, however, cooking it may be different than fattier cuts. However, using the right cooking methods can help you to make the most of this healthy meat. Because ostrich steaks are so lean, they require a high heat, quick cooking method to keep them tender and prevent them from drying out. Methods such as grilling and sautéing are perfect for this. Give the steak flavor by marinating it for two to three hours. You can use any poultry or steak marinade for this purpose. Put the steaks in a plastic zipper bag and add the marinade. Refrigerate for at least two hours, and up to eight hours. About 30 minutes before cooking the steak, remove it from the refrigerator and the marinade. Reserve the marinade. Pat the steaks dry with a paper towel and allow them to sit at room temperature. Preheat a gas grill, charcoal grill, or grill pan on medium-high heat. Grill the steaks over the high heat, three to five minutes per side, until the internal temperature of the meat is 140 degrees Fahrenheit, which is medium-rare. Allow the meat to rest, tented with foil, for 15 to 20 minutes to allow the juices to reabsorb into the meat. If you wish, bring the marinade to a boil over high heat and boil it for five minutes to use as a sauce while the meat rests. 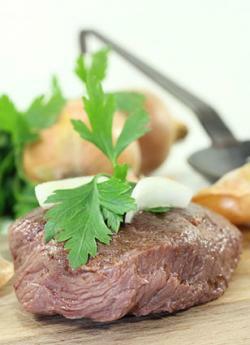 After the meat has rested, slice the steaks against the grain to shorten the fibers and render it tender. Sautéing is another high temperature method that will work well for the steak. Marinate the steak for two to eight hours. Pat the steaks dry and rest them at room temperature for about 30 minutes. Reserve the marinade. In a large sauté pan, heat two tablespoons of oil over medium-high heat until it shimmers. Add the ostrich steaks and cook over medium-high heat until the internal temperature reaches 140 degrees Fahrenheit, three to five minutes per side. Remove the steaks from the pan and set them aside, tented with foil. Allow the steaks to rest for 15 to 20 minutes. Meanwhile, return the pan to the heat. Pour the reserved marinade into the pan, using the side of the spoon to scrape up any browned bits from the bottom of the pan. Bring the marinade to a boil and then reduce it to a simmer. Simmer for about five minutes until it reduces. Slice the rested steaks on the bias to tenderize. Serve the steak with the pan sauce spooned over the top. You can also cut ostrich steaks and fillets into thin slices before cooking them and stir-fry them with your favorite vegetables. Cut the raw steak against the grain into thin slices. Marinate the steak slices in your favorite marinade. Remove them from the marinade and pat the pieces dry with a paper towel, reserving the marinade. In a large wok or sauté pan, heat two tablespoons of oil over medium-high heat until it shimmers. Add the ostrich slice and cook, stirring frequently, until cooked through, about three minutes. Remove the ostrich from the fat in the pan with a slotted spoon and set it aside on a platter. If no oil remains in the pan, add two more tablespoons. Otherwise, just use the fat that remains in the pan. Add any vegetables you wish to use and cook, stirring frequently, until they are crisp-tender, which takes about three to six minutes depending on the vegetables. Return the ostrich pieces to the pan, adding any juices that have accumulated on the platter. Add the reserved marinade. Bring it to a boil and then reduce the heat to medium low, cooking for another three or four minutes. Ostrich roasts present a bit of a challenge, because they have only very small amounts of intramuscular fats, which makes them prone to drying out in the long cooking process. To keep them from drying out, the World Ostrich Association recommends cooking them in a roasting bag, which will help retain the moisture; so will braising with liquid over very low heat. When cooking an ostrich roast, which comes from the upper leg of the ostrich, use a roasting bag. Season the roast liberally with salt and pepper, or any other seasoning blend. Allow it to rest at room temperature for about 30 minutes. Put the roast in a bag and seal it. Put the bagged roast on a rack in a roasting pan. Roast in the preheated oven for about 30 minutes per pound until it reaches an internal temperature of about 145 degrees Fahrenheit. Rest the roast in the bag out of the oven for about 30 minutes. Remove the roast from the bag, and slice to serve. You can braise on the stovetop, in the oven, or in a slow cooker. When you braise, you add liquid and cook the roast, covered, over low heat to help retain and infuse moisture. Heat two tablespoons of oil in a large pot over medium-high heat until it shimmers. Add the roast and cook until browned on all sides, about four minutes per side. Remove the roast from the pan and set it aside on a platter. Add any aromatic vegetables, such as carrots, celery, and onions to the oil that remains in the pan. Cook, stirring occasionally, until they begin to soften and brown, about five minutes. Add about a cup of a braising liquid, such as red wine, chicken broth, or a combination of both, to the pot, using the side of the spoon to scrape any browned bits from the bottom of the pot. Add any herbs and spices you wish to the pot. Return the roast to the pot and add additional braising liquid until it is about half-way up the roast. Bring the pot to a boil. Cover it and reduce the heat to medium-low. Simmer on the stovetop until the meat is cooked, two to three hours. Alternatively, after you cover the pot, you can put it in an oven preheated to about 300 degrees and cook for two to three hours, until the roast is falling apart. You can also put the browned roast, browned vegetables, braising liquids, herbs, and spices in a slow cooker and cook on high for about four hours or on low for about eight hours. Cooking ground ostrich is very similar to cooking ground beef. Use high temperatures and cook it quickly, or it will dry out. Cooking ostrich patties follows a similar method to cooking steaks. You can either grill them or sauté them over high heat. Season the patties with salt and pepper. Cook on a preheated grill over high heat for three to five minutes per side until the internal temperature is 150 degrees. Alternatively, cook them in a nonstick pan brushed with oil over medium-high for three to five minutes per side. You'll need a bit of oil when you cook ground ostrich into crumbles to help keep it moist. Heat two tablespoons of oil over medium-high heat until it shimmers. Add the ostrich and cook, crumbling with a spoon, until it is well browned, about five minutes. Cooking ostrich meat is a fairly straight forward process. Because it is so lean, the most important thing to do is watch it closely so you don't wind up with a tough, overcooked piece of meat. With the right cooking method and careful attention, you'll make delicious meals using this tasty meat.